Today, I'm sharing another layout I made with the September kit at My Creative Scrapbook. 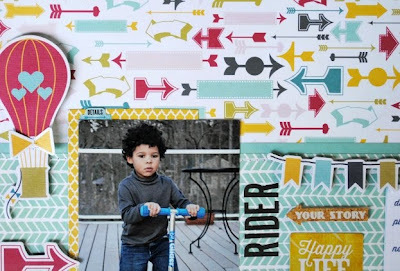 The kit was a fun mix of collections from Fancy Pants Designs and Echo Park Paper. 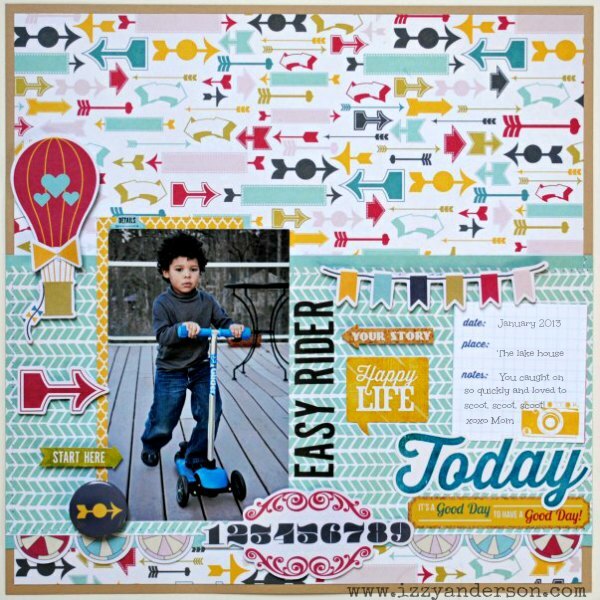 I love the fun arrow paper and thought it was perfect for this photo of my little one scoot, scoot, scooting along. I paired the arrow paper with a blue chevron paper to emphasize movement then added a few arrow embellishments for good measure. 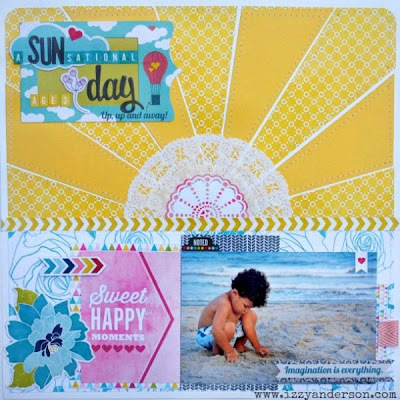 You can find all the details of this kit on the main page of My Creative Scrapbook. Hello everyone. Today, I have a page full of sunshine. I made this beach layout with Echo Park Paper's Here & Now collection, which was featured in the September Creative Kit at My Creative Scrapbook. 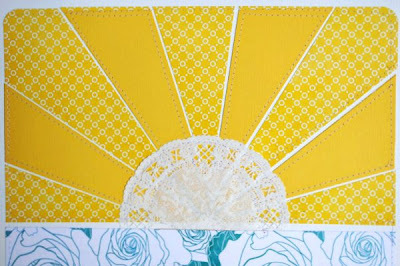 To make the sun rays, I started by cutting a piece of yellow patterned paper 11.5 inches across and 7 inches tall, rounding the top two corners, and placing it on top of white cardstock. 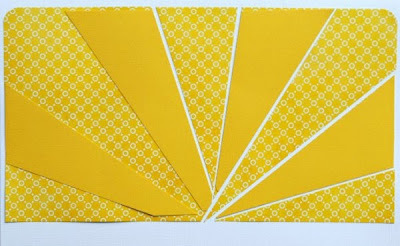 Then, starting left to right, I cut yellow cardstock in the shape of rays and lightly tacked them on top of the yellow patterned paper. You can see that on the left side above. I wanted to have a little light shining through (as you can see on the right side above), so I used a paper cutter to trim each side of the rays. 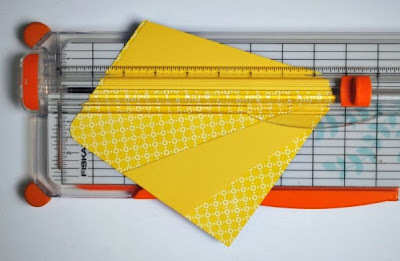 When trimming, I kept the cardstock rays on top of the yellow patterned paper as a guide for where to cut. Once I had all the rays in place, I stitched them down. A white doily hides any imperfections where the rays meet in the middle. 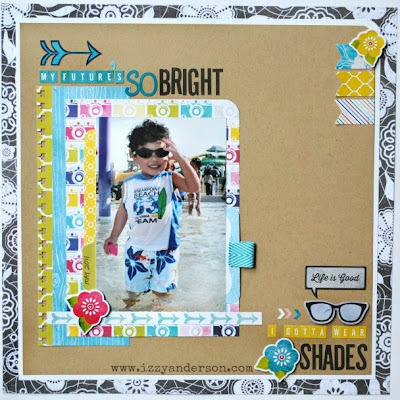 I added a title block at the top using a frame and die cuts from Fancy Pants Designs and alphas from Echo Park. To make the transition smoother from the sun rays at the top to the blue patterned paper at the bottom, I used a yellow tape sticker. The chevrons guide the eyes across the page to the photo. Above is another look at the completed layout. 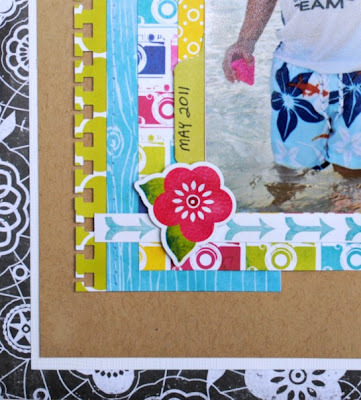 The ribbon tab to the right of the photo pulls out to reveal hidden journaling. Thanks so much for stopping by. I'll be back tomorrow with another layout from this kit. 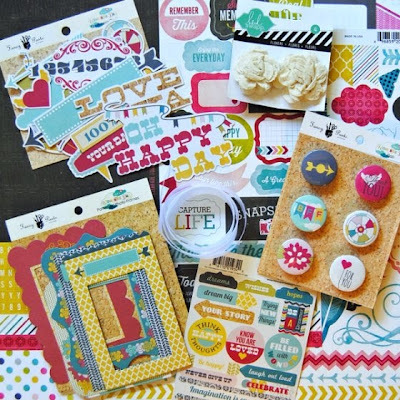 The September kits are here from My Creative Scrapbook and I love them. 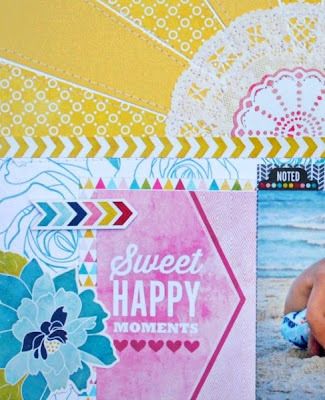 I played with the Creative Kit this month, which had a mix of Echo Park Paper and Fancy Pants Designs. I took my layout title from that 1980s one-hit wonder: My Future's So Bright, I Gotta Wear Shades. It was by a band called Timbuk 3. Sorry if I gave you an earworm! 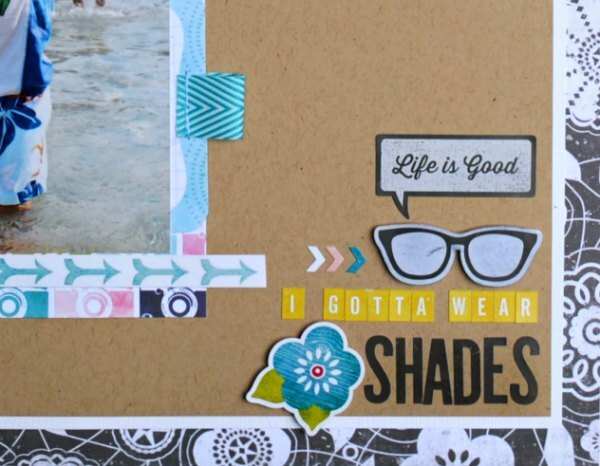 The Echo Park elements sheet included a nerdy glasses sticker. I shaded it with a grey Prisma marker and used it here as sunglasses. I'll be back next week with more work from this kit. Have a wonderful weekend! 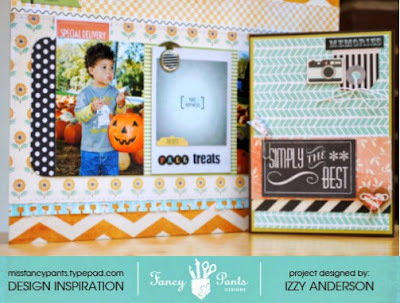 Hello and a big warm welcome to the Fall Splendor Blog Hop with PaperHaus Magazine! We are celebrating our FALL edition, which also is our 1 year anniversary. Yay! I am delighted to be part of this team. 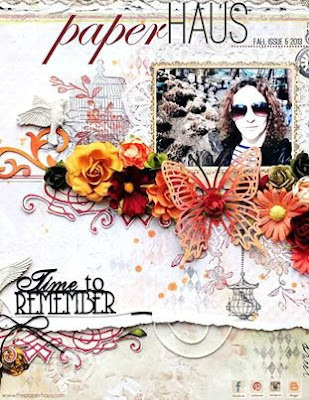 Above is our Fall cover and you can read the issue using this link. To celebrate the new issue, we will have a short blog hop each day through Sept. 15. There are lots of prizes up for grabs each day. If you are following along on the hop, you should have arrived here from the PaperHaus blog. I made a card with a glassine bag gift card holder using the pretty Fall hues in the Memories Captured collection from Fancy Pants Designs. This collection has such a fun mix of yellow, orange, green and black. I think I am going to use this line to scrap some Halloween photos. I love the way that aqua blue is seeping into Fall and holiday lines this year. Did you notice that with the new CHA releases? 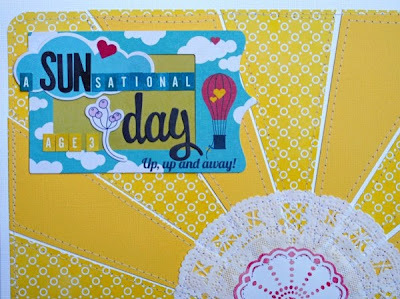 Giveaway alert: The cute little flair on the card front is from the Fancy Pants Designs collection, What A Wonderful Day. 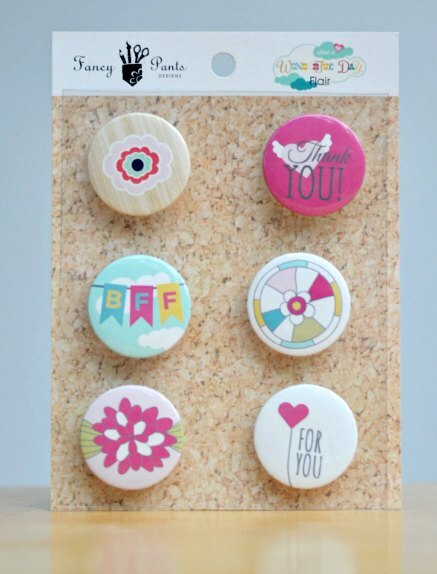 I received an extra set of this flair and I would love to pass it along to one of you, my readers. Just leave me a comment to enter. Today's blog hop is sponsored by Spellbinders and they have offered up a generous prize. You can find all the details on the PaperHaus blog. The winner of both giveaways will be announced on Sept. 16. Next up on the hop is Jodi Baune. I know she'll have something amazing!